What materials do you use in prosthodontics? What Cosmetic Dentistry services in Bellevue do you provide? 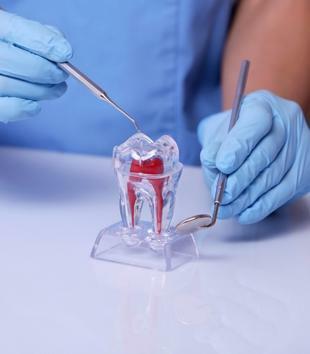 At Washington State Prosthodontics, we use advanced materials such as Zirconium (high-strength porcelain) and non-allergic dental alloys, such as titanium, to fabricate strong, esthetic crowns and bridges. We also use the highest quality denture teeth to create life-like dentures for optimum esthetics. Missing teeth can have a significant effect on your personal appearance. When a tooth is lost and a space is created pressure from normal function and your teeth touching together can cause the remaining teeth to shift. This shift can cause otherwise healthy straight teeth to tilt. These tilted teeth can become unstable which makes them more likely to be lost in the future. Missing teeth will make it more difficult to eat and place more stress on the remaining teeth. The teeth also support facial tissue such as your lips and cheeks. When missing teeth are not replaced and gaps are left open, the tissue can “cave in” adding years to the person’s appearance. 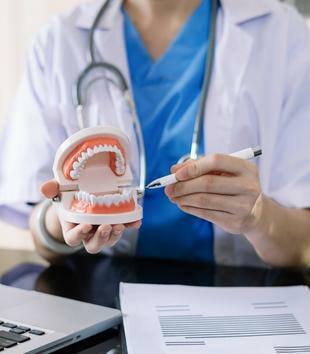 We provide dental implant restoration in Bellevue (the prosthetic attached to the implant, such as a crown, bridge or denture), full and partial dentures, crowns, bridges, fixed prosthetics, as well as full mouth restorations. We are also the specialists in Bellevue to see when you’re considering cosmetic dentistry.